Selectman Melinda Loberg and moderator Deborah Medders. 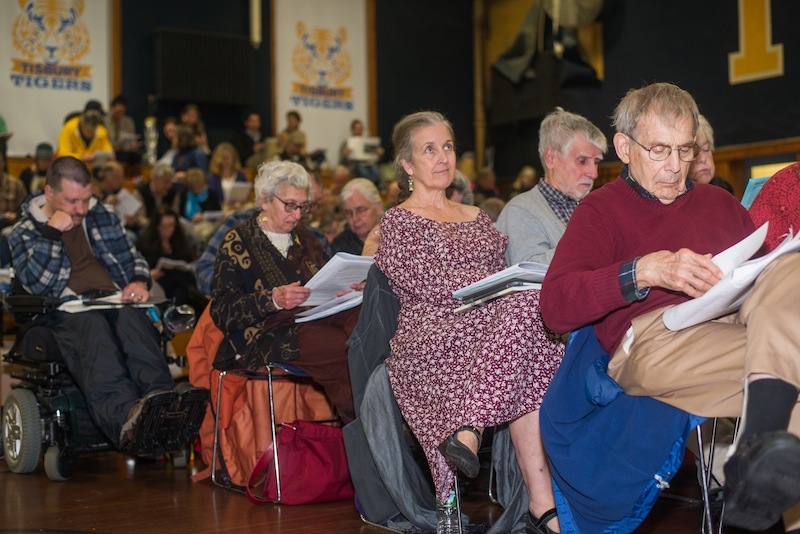 Tisbury voters approved affordable housing funding, some sewer extensions, and a variety of spending items Tuesday night, finishing a special town meeting and working through about a third of the annual town meeting warrant. Several big spending items, including $1.8 million to bury power lines on Beach Road, a $27.1 million budget, and $50,000 for engineering and design for a new sewer district on State Road, remain up for discussion as the meeting continues Wednesday at 7 p.m. at the Tisbury school gymnasium. Moderator Deborah Medders called the meeting to order at 7:17 p.m. on a rainy Tuesday evening. A total of 228 voters were on hand to take care of town business, beginning with a 15-item special town meeting warrant that was taken care of in about an hour. Voters easily approved amendments to zoning bylaws that added definitions for affordable housing and site review, a new labor position for the public works department, and an article submitted by petition that would deem the license of Island Adventure moped rentals null and void. Town counsel David Doneski said the vote would act as a recommendation to the selectmen, who issue the license. A new sewer line extension to High Point Lane was unanimously approved, but voters debated an extension to the new Martha’s Vineyard Museum site at the Old Marine Hospital. Clarence A. (Trip) Barnes, a member of the Martha’s Vineyard Commission, said he was asked to point out that the extension would reduce the opportunity for others who wish to tie in to the system. Selectman and wastewater commissioner Melinda Loberg said the sewer system now has the capacity for an extra 25,000 gallons per day, along with gallons that are not being used. The museum has requested a flow of 2,400 gallons a day, she said. 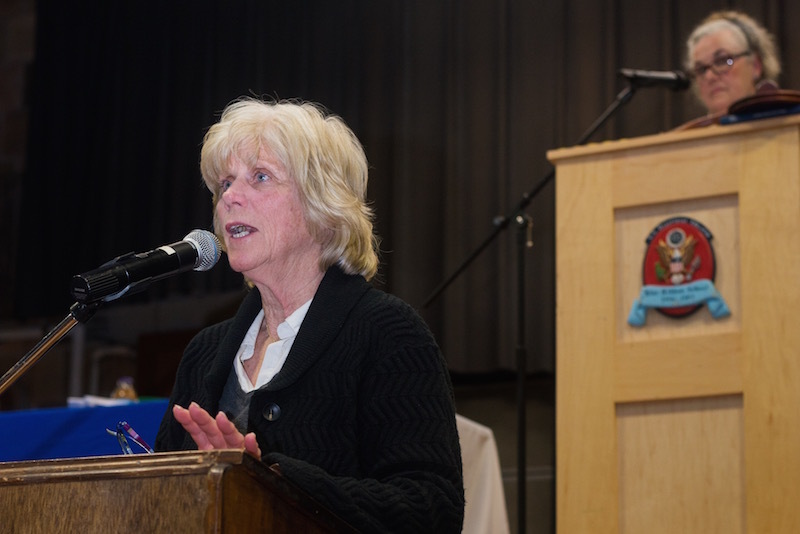 “This would not effectively shut down the availability of other users to tie on,” she said, adding that the measure would reduce the cost for other users and protect the Lagoon from nitrogen. The sewer line was approved. Voters turned down a request for a new department secretary position for the planning board, which planning board member Daniel Seidman said would help the board with an increased workload. 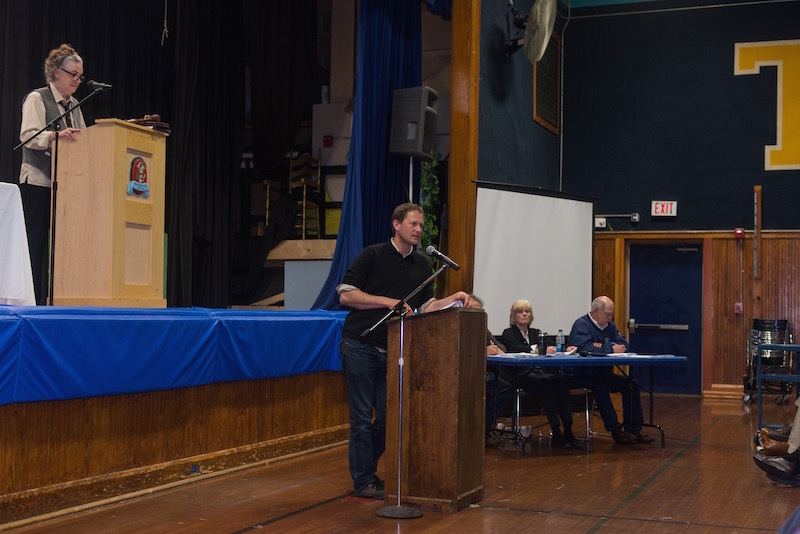 With special town meeting finished voters turned to the annual town meeting, beginning with a look at town finances from finance director Jonathan Snyder. “If we pass everything on the warrant tonight, our [tax] rate will go up a scooch but not dramatically,” he said. Voters easily approved $50,000 for repairs to town docks at Owen Park, $50,000 for engineering and design for drainage at Smith Brook on Lambert’s Cove Road, and $400,000 for projects that fall under the state’s Complete Streets program. The projects are entitled to reimbursement. Voters approved more than $1.3 million in Community Preservation Act spending, including $50,000 to restore the historic porches at the Marine Hospital and $85,000 to help replicate the historic roof as well. 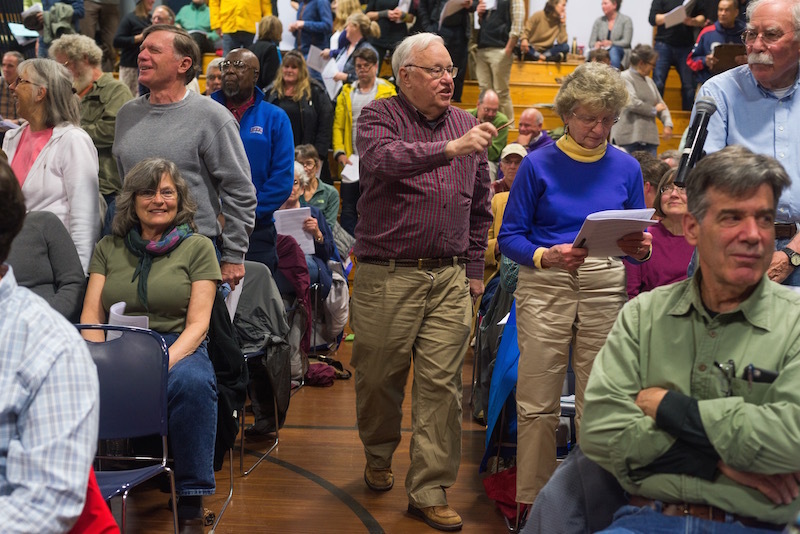 Voters also approved a total of $469,650 to support the 20-unit affordable housing project on Kuehn’s Way in Vineyard Haven after lengthy discussion, with abutters saying they were concerned about the project contaminating well water and others questioning the cost of the project. Other debate centered on who would be eligible to live on the property and how much each town would contribute. Katherine Kavanagh questioned the reluctance of the voters. 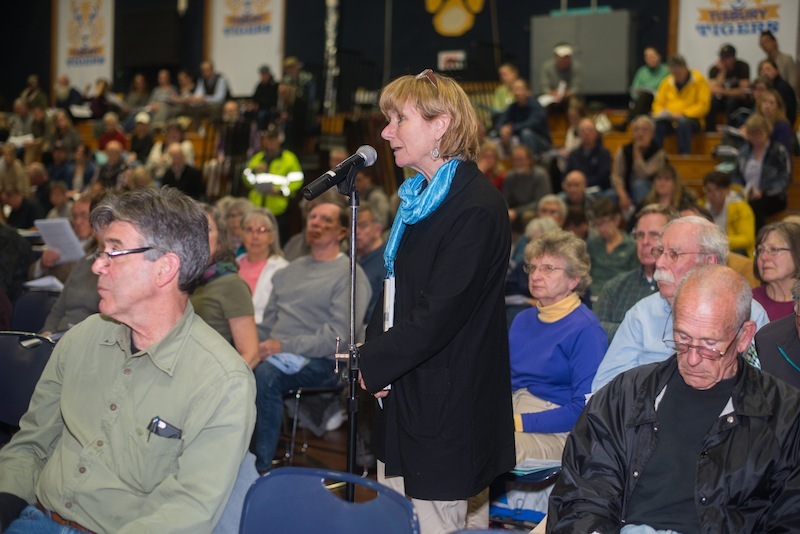 Catherine Mayhew asked the town to focus on taxpayers in the room who are afraid of their drinking water being contaminated. “Come on people, stick up for your own voters,” she said. A motion to table one of the articles failed, but an amendment restricting the dispersal of funds until all required permits have been obtained passed. Voters ultimately approved the funding. Tisbury followed other towns in agreeing to participate in funding the First Stop information service. Funding has also been approved in Chilmark, Edgartown, West Tisbury and Oak Bluffs. After about three and a half hours the meeting was adjourned until Wednesday, with 26 articles left on the annual town meeting warrant.